It’s the middle of the summer, but it’s never too early to start thinking about the fall 18 trends, specifically hair trends. There were so many different looks on the runways from wet and loose to slicked back and tight. 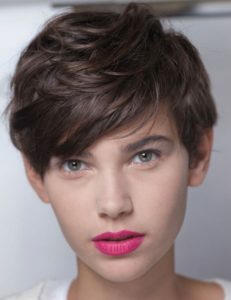 Have you started thinking about different haircuts for the upcoming season? With a little a research and some creative liberties, a new cut could be the catalyst for that project, move, or life decision you have been putting off… until now. 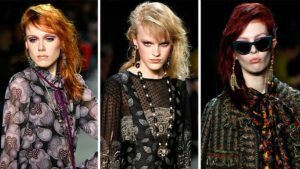 While hair trends are significantly influenced by the work shown on fashion runways, hair trends don’t disseminate as quickly or obviously as do color trends in clothing. But hair trends do exist equally as prevalent and strong. During the runway shows for the Fall 18 season, we saw many different hair styles, but there were a few key trends which were standouts. The cuts most likely to end up being sought out this Fall include the Angular Blunt Bob, 70s Swoop, Razor Sharp, Curly Bob, Baby Bangs, Fuzzy Fringe, the Wavy Lob, and our two favorites, the Garcon and the Side Swept Bangs. Both of these haircuts are so different, but yet they exhibit femininity and newness which is overdue. The Garcon may be seen as France’s version of the tomboy haircut. With a short length and straight parting in the temple areas (which deflects the face and neckline), the cut gets updated for 2018 with more volume and messiness. It’s a great choice for someone who wants to go short, but not pixie short or the extremeness of a bowl cut. Our other favorite, the Side-Swept Bang. Bangs have been so “perfect” for so long. It’s refreshing to see bangs in various lengths, parted to the side and/or side swept off the forehead and face. At Dion Lee, Hairstylist Eugene Souleiman created side swept parts which were smoothed over and then purposefully let flyways come out. If you aren’t yet ready for a new haircut, there were many cool styling and accessories which can keep you up to date. There were 60s beehives, 90s accessories, DIY topknots and Neo Braids. Alexander Wang and Prabal Gurung brought back two classic hair accessories, the claw toothed clip and the claw tooth headband (respectively). We can see both versatile for eclectic lifestyles from the ball room to the gym. Jil Sander created a cool hybrid, finishing off a topknot with two long braids. This futuristic style is cool enough to be chic, but not too extreme to raise eyebrows. Although you may be sitting at the beach reading this post, the Fall season will be here before you know it. There are many cool hairstyles just waiting for you to experiment. As August rolls around, consider consulting your hairdresser early. The style you want may not be suitable for you, or it may call for a difficult transition from your current style. 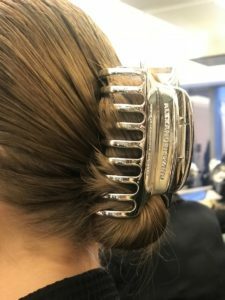 If all else fails, the Alexander Wang Claw Clip can pull your hair back while you’re growing your hair out for a new style.